Pretty much agree with everything that's been said already wrt the character. I was drawn to the costume before I'd seen the film. Loved the lightsaber as soon as I saw it in the preview, fell in love with the voice as soon as I heard him say 'I will finish what you started'... and then I sat down to watch the film and this is where the fun began. I was enjoying the whole Knight of Ren shtick and then we get to the interrogation scene (and I had never seen Adam Driver before this film) and then he whipped off that helmet and I was floored. He's so beautiful in an unusual way. He ticks all the boxes as far as film characters go; he wears black, he wields power, he's got dark hair, he's tall, has an amazing voice and he's a sufferer. I'm a sucker for the pained and, in this case, torn apart. I love that he was undone by the end of the movie and I can't wait to see how he recovers from what has happened to him. @dark_disciple we were always going to be doomed but i love how 'wearing black' is an actual criterium for you. i think one of the fascinating things about the character in comparison with vader is that it is all done by one person. vader was a composite of a body and a voice and a costume and then two more actors doing pre-suited age stuff. i think for this reason alone, the casting was always going to be crucial. You're right about Vader though, he IS a composite. Thank the Force that JJ et al picked Adam to play Kylo. As an aside, his mug is on so much merchandise, things you wouldn't expect. I had the Kylo Ren shower gel (to wash away the cosmic dust, according to the bottle) but they really need a swag of hair care products to go along with that. i do like a good costume but i'm not partial to the colour as such, my favourite recent costume, pre-TFA-brainwash was bathsheba's leather coat in 'far from the madding crowd'. i think it's her lucky coat as well but that's for another story. and i pined for that coat. but i'm nowhere near as nimble and petite as carey mulligan so nevermind. i do wonder how much say adam driver had in creating the character. i also wonder about how he was directed. when watching now i think, all the other scenes are mostly filler and it's so unfair but it feels that way, and his scenes are tight and on point and they are dramatic. Agreeing with all of the above-- and I'll add that he's also compelling because he has potential for change whether it's toward the light or the dark. This also makes Rey compelling, I think. Remember J.J. Abrams and that Kurosawa quote about how the ones who are still changing are the heroes, while the villains are locked and petrified? That. Or the definition of a protagonist as someone who actually changes throughout a story-- everything is set up for this guy to change and grow (hopefully toward the light. And Rey.). Taking the mask off-- surprising and compelling. The fact that this was an intelligent, quirkily handsome guy and not some dim witted Hollywood pretty-boy-- compelling, like the HP folks casting the very intelligent Emma Watson as Hermione. The fact that he goes from Darth Bad*** to Darth Boyfriend once the girl shows up-- compelling, like Jareth the Goblin King in Labyrinth. Wearing his emotions on his sleeve, and being scrupulously honest with Rey, and yet still being the villain-- wasn't expecting that. His obvious outsider status within the First Order. And that raw, intense, kind of animalistic lightsaber fight, and the offer to be Rey's teacher-- this was the most sexual tension I've seen in a Star Wars movie since The Empire Strikes Back in 1980, but instead of being suave and cool like Han Solo, he goes from sweeping her up in his arms to completely falling apart and more or less begging. Adding to the stuff about the first scene that many people have mentioned-- I immediately compared him to Vader, who walked so stiffly-- Kylo Ren's walk is much younger and more lopey, but very determined. I had avoided spoilers and had no idea who the actors were except the OT, of course, but you could tell this was not a mature figure. But what really struck me was how he crouched down to get to Poe's level and was right in front of Poe-- I remember thinking, "This guy is going to get right into the thick of things, not just send his minions." Probably an AD idea, there, actually-- he seems very into the physical nuances of acting. @guardienne Of course wearing black is a criterion! I didn't mention it cause it's a darksider staple in Star Wars I guess. And I agree with you that he kills Han and then he's the one who seems to be suffering the most. It's interesting. Plus, the man has got some skillz with the lightsaber and hands. Gotta appreciate that. I seriously think the hood is glued or attached to his head, otherwise it's just one more force power, other than awesome non helmet hair. And... one more gif, the "classic" one. The interesting thing is how his face looks soft and even feminine, and how that contrasts to what we saw before. So I guess contrast and contradiction are compelling factors as well. @force22 he is a bunch of contradictions rolled into one. i'm surprised how AD is holding things together... i'm guessing that it's to do with him being the only person having to hold it together. @lily snape he isn't the suave kinda person. i love that so much. he is so awkward in almost every way. that is so strangely relatable. Adam Driver makes Kylo Ren compelling...no one else can play Kylo like he does. JJ and Kathy know what they're doing..Reylo Forever!!!!!!!!! Adam does a fantastic job capturing the emotional complexity of this character. Even though we were presented with very little backstory as to why he became the Dark Sider he is, his performance is so compelling and 'real' that you cannot help but immediately become interested and then outright engrossed in this character. Being able to convey that emotional turmoil and hurt onscreen , and while your face is masked for a good portion of your scenes, is not something just any actor can pull off. Yes, the director must take some credit for the performance too.......but Adam plays the role with such a inherent honestly that one cannot help but become captivated by what they are seeing taking place on screen. I just keep coming back to the vulnerability of the guy. When he goes to Snoke straight after his confrontation with Rey. He's so flustered, he's forgotten to put his helmet back on? He's whining about how she is 'strong with the force' and she whipped his a** with her mind skills and he's reeling from it in front of his master... and just before the snow fight when he confronts Rey and Finn he says something so ordinary, not very profound, 'it's just us now', he's weakened but he's still trying to put on a show. I love the look he gives them. Wtf??? What kind of villain this is...this is going to be another sucky SW movie...yuck..
@Kylo Ren major bonus points there for including the Loki gif but yeah, the character had me even before the de-helmeting. Everything that comes after that is just awesome and amazing. @Dark_Disciple wrote: @Kylo Ren major bonus points there for including the Loki gif but yeah, the character had me even before the de-helmeting. Everything that comes after that is just awesome and amazing. Holy wow this character is brilliant. I wish I was this wrong about movie characters more often. Yes definitely. I was so surprised when he took his mask off, but at that moment I knew that this was going to be a very different portrayal of a villian. Aside from all the great things mentioned here about his character and overall design, the brilliant portrayal by Adam Driver, the hair, the voice, the eyes, the lightsaber twirling, the narrowing of the eyes when he says "We'll see".... I'd add that I just really love his body language: slow, deliberate, dangerous. @Darth Rowan wrote: Aside from all the great things mentioned here about his character and overall design, the brilliant portrayal by Adam Driver, the hair, the voice, the eyes, the lightsaber twirling, the narrowing of the eyes when he says "We'll see".... I'd add that I just really love his body language: slow, deliberate, dangerous. Might as well make a brief first post before I go to bed. Fantastic first post, I enjoyed reading every bit of it. I agree that Kylo's Force abilities are fascinating and intriguing. I hope they keep pushing things into new directions with him; if he can stop a blaster shot mid-air (and that's an awesome, awesome scene, and I love that they had Poe reacting in place of the audience, actually turning back to stare at the frozen beam of energy with the same awed expression I was wearing as I watched) I can only wonder at what he will be able to do once he is more advanced in his training. 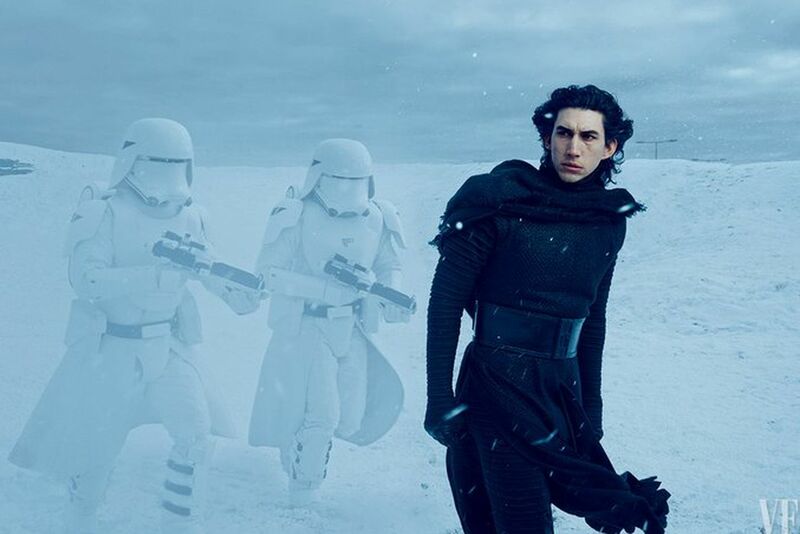 For me the bottom line is that Kylo Ren is like the Ferrari of Star Wars characters. The care they've built him with, the level of complexity, is really just something else. I don't think he'll fit neatly into any category; just as he isn't completely evil now, I don't see him being completely "good" in the future, even if (hopefully when) he is redeemed. I don't think he'll ever be pre-Kylo Ren Ben Solo again, whatever that means. He cannot, not after what has gone down in TFA with Han. I would love to see him be "resolved into gray", as the little poem says. Temporarily working with the good guys for the greater good, but still following his own sense of what is correct once he recalibrates his moral compass and figures things out since he is so very confused right now, imo. I'd like to see him walk away from institutions, from fakeness and ambitions of power and leadership, at least for a time immediately following the current events. I'd just like to see him do his own thing, whatever that is. Hopefully with Rey at his side, but we shall see. We see his control of the force again when he freezes Rey, and then makes her pass out. So, here we have the ability to both subdue and capture someone in a way that can't be defended against, and leaves the captive utterly unharmed. Add to this the ability to mind probe, a power that has shown up before, but Kylo seems particularly good at and it paints a picture that he purposefully uses force abilities he may well have invented and the force in general in none-lethal ways. Very odd for a dark sider, who typically choke first and ask questions later, or at the very least rely more on their lightsaber than the force. To put it in fantasy context; practically every Jedi/Sith we have seen before are warriors who use a bit of magic, but Kylo is a wizard who just so happens to be able to use a sword. You can see from his 'saber duels (albeit wielded in a stylish and skilled manner) that while he is better with his blade than a Padawan, he is nowhere near as good with it [/b[b]]as even a Knight of the old order. I also find it interesting how you call him more wizard than warrior. I think Adam Driver plays him with a warrior mindset, but he plays him as an unpolished warrior. Fearless and aggressive with basically no concern for his own safety. The man is like a tank, a bit of a crazy tank, but a tank nonetheless, beating his wounds while he's bleeding out (from a shot that sent other people literally flying to their deaths) so he can just keep fighting on no matter what. He has some beautiful moments (the twirling, that bit when he freezes Rey on Takodana), but he is not like the Russian ballet Jedi Anakin and Obi-Wan were ... and I like him all the better for it. I liked how his fight with Rey was messier and grittier and in the moment. I like how he "never broke dark side" even though he was getting injured all over the place in the Snow Fight. (Now I am one who believes that by that point he has "fallen hard" for her and really doesn't want to hurt her at all ... but given the mental downsides of the darkside, even if he is completely in love ... is that enough to stop the dark side craziness if somebody gets really worked up in the pain of a fight?) Instead, he does exhibit an enormous amount of control with her even though he is the midst of a full-on mental breakdown from killing his father. It's really extraordinary when you think about it ... and it really makes you wonder what he is really about ... how did he finally end up with Snoke ... why has he not fallen the way the rest of the darksiders have ... but why still does he feel like he *needs* that darkness enough to kill Han ... because I don't believe he wanted to do that at all. It's all incredibly compelling and I hope Episode VIII lives up to the potential they have set up with him ... But back to your wizard point, you're right. It's in his force skills where his true elegance lies. Finally, just fyi, I'll confess that I personally probably lean more towards the "poor baby" view of Ren in a lot of ways because (1) I think the half-dark/half-light force tendency must have been tortuous his whole life, and (2) I really find the fact that Snoke was a child predator whispering in his head from early childhood to be unbelievably evil to the point that Kylo/Ben has kind of had his potential stolen and possibly had his mind, while forming, altered. If you really think about it, Snoke could have not only manipulated him for years in a terrible "voices in your head" kind of way, but even worse could have implanted horrible, yet non-real memories in his head of people hurting him (perhaps even his family) and him hurting other people (causing him to think he is meant for total darkness when he is not). I also find it impressive that he seems to have resisted falling to Snoke in spite of this for about 23 years ... which to me shows a lot of strength and something inherently good in his soul ... perhaps that's why when he does fall he can't help but mitigate his darkness into non-lethal actions ... because some part of him is still fighting Snoke (I definitely believe in all his confusion he has his own agenda) and because his force composition won't let him go all dark. But though I am very sympathetic to him as someone who has suffered and been abused and who has been probably coded for mental illness, I can see why you almost don't want him to be redeemed. The characterization has so many possibilities that a unique, less-lethal darksider could create incredible storylines. I loved it when he was a bada** forceuser almost as much as when he was vulnerable, and if this was a 7 season TV show I would be all for exploring all kinds of things because you would have all kinds of time to make different turns along the way. But even with my sympathetic view of the character, not for a second do I think he should return to some cutesy Ben Solo. I want the rehabilitation and the atonement. But in the end I would like to see him actually being able to live out his potential as Kylo/Ben ... the hybrid-dark-light guy he was born as and was meant to be. He's got blood on his hands, but he's not Vader or Maul ... he's not completely gone. He can turn back. Personally, I'm a big believer that the theory that he is meant to be a Rogue/Ronin-like/Grey Jedi, but that he has had to suppress his dark with Luke and has had to suppress his light with Snoke ... and that lack of acceptance of himself, along with whatever mental damage he has from Snoke, has made him very vulnerable emotionally when something personal is involved (Han, of course; Rey, (I think he may have had visions of her before); and LST and his acolytes (I think Ren had some kind of old bad blood with them from the Luke days). I think once he comes to terms with his full identity and looks his demons in the face, his wizarding skills as you say, might be off the charts, because he will not be wasting energy burying part of himself. Edit: I have a lot of favorite parts apparently.